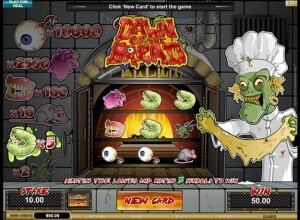 Try Dawn Of The Bread Scratch Cards Game Now for FREE! Step 1 – Click on the plus or minus buttons to increase or decrease your stake in Dawn Of The Bread Scratch Cards. Step 2 – When you're ready to play, click on the orange new card button to start. Step 3 – The goal in Dawn Of The Bread Scratch Cards is to match up three of the symbols displayed to your left to win. Dawn Of The Bread Scratch Cards is quite simply and obviously a play on the very successful Simon Pegg film, and similarly sounding Shaun Of The Dead. The movie deals with zombies, and this scratch card involves a zombified Chef, the connection is woefully obvious. Despite some pretty comedic looking critters featured in this game, there isn't really a whole lot to compliment this scratch card with. The zombie chef serves up several rotten and gnarling symbols for you to scratch away to reveal if you have won something nice. Dawn Of The Bread Scratch Cards is essentially a Halloween game, but could easily pass for somebody's form of entertainment at any other time of the year. The beetle is the lowest winning symbol in Dawn Of The Bread Scratch Cards, worth double your stake, whilst the popping eyeball is worth a frightful 10,000 times your stake. You can play Dawn Of The Bread Scratch Cards free by playing the Dawn Of The Bread Scratch Cards demo on Lord Bingo.